We ate tonight at one of our very favorite restaurants in Seattle - 94 Stewart. We first experienced this place a few years ago during the Feast at the Market, a fund raiser for the Pike Place Market health clinic. The Chef/Owner Celinda is always in the kitchen (located in the front of the restaurant) and you can speak with her on the way in or out! 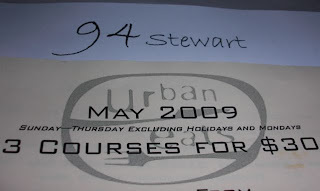 Tonight was the last night of the Urban Eats May special and we couldn't resist a visit. I started with the "Greens", a lovely salad with candied walnuts and a tangy, dressing. 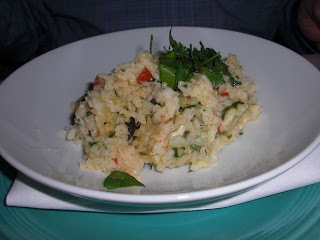 JC had the Crab Risotto, a creamy, crabby, cheesy, parsley topped delight. 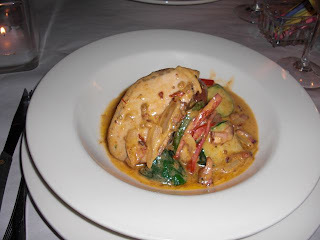 I ordered the Hanger Steak, served rare and quite good, but JC's "chili creamed braised pork loin" was really tasty. Smoky lardons were liberally distributed in the lovely, yet back-of-your-throat-hot sauce. It was delicious!! 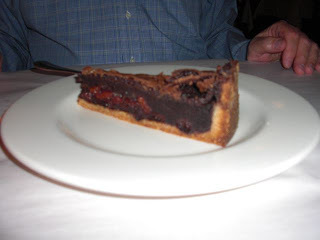 For dessert, JC had the yummy cherry chocolate tart, and - much to JC's dismay - I ordered the cheese plate: blue cheese, french goat cheese, and a sliced strawberry - perfect!! That all looks fabulous...I like JC's picks! I would have definitely gone with the crab risotto and Chocolate Tart. Good wine parings also, I assume? The location of 94 Stewart is also very convenient to the market but still tucked away on a side street so it seems very quaint. I remember going there and liking it very much! I haven't been there! Wait until you visit Denmark, mom. 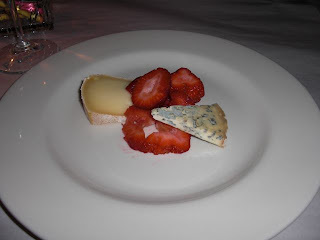 Cheese with wine is a very popular dessert.